¶ 6 Leave a comment on paragraph 6 0 Millions of Americans learned philatelic practices and connected with fellow collectors through these publications. ¶ 7 Leave a comment on paragraph 7 0 Many individuals contributed to this print culture even if their papers were short-lived. One teenager, known later in life for his fiction, started Stamp Collector in his Syracuse, New York, home. L. Frank Baum printed at least four issues of this serial between 1872 and 1873. During the 1870s—“the golden age of amateur publishing”—it was not uncommon for boys, more so than for girls, to create publications using the Novelty Toy Printing Press and to distribute them locally or to mail them to interested young readers around the country.5 Baum was no doubt familiar with these and other stamp-related papers as he created his own. ¶ 8 Leave a comment on paragraph 8 0 While young printers delighted in their creations, some adults cringed at the abundance of amateur publishers. One adult writer found no “earthly use” for amateur papers he claimed were produced by boys with “limited knowledge” of stamps that “only bring ridicule upon collecting from outsiders” and disgust from “advanced” collectors.6 If forming stamp clubs and publishing journals helped to legitimize the hobby of stamp collecting, the interest generated by younger collector-publishers was viewed by some as a distraction rather than as a boom to stamp collecting. Even the smallest and shortest-lived papers show us that there was great enthusiasm for participating in a public discussion about stamps and the practice of collecting them. ¶ 11 Leave a comment on paragraph 11 0 Kantner’s disapproval of the proliferation of stamp papers continued the following year when he decried that “the ‘stamp fever’ had become the ‘publishing fever.’” His article actively discouraged “all ambitious young men” from starting new papers. In December 1894, the Weekly Philatelic Era rejoiced that an “exceedingly small number” of new philatelic papers appeared that season, which was much more pleasant than the “obnoxious” mushroomed-growth of past years. An author for Philatelic West desired to start his own paper in the 1890s and reflected how fortunate he was that he did not burden himself and the “already long suffering philatelic public” with such a venture.8 These collective comments demonstrated that while some stamp associations openly encouraged all to collect stamps, not everyone agreed that all collectors should participate in the philatelic print culture, or even the broader community of philatelists, equally. Within the philatelic community, philatelists drew lines among their own. ¶ 12 Leave a comment on paragraph 12 0 Applying a hierarchical framework to stamp papers and journalists was in keeping with the post-Civil War tendency to distinguish between high and lowbrow activities.9 Even as stamp collectors tried to construct a cultural space for themselves as learned individual through clubs and readership of journals, some proposed fracturing within their own ranks. Kantner proposed instituting hierarchical labels for philatelic publications. He categorized papers into four classes: professional, semi-professional, amateur, and price-list journal. He classified his own journal, Pennsylvania Philatelist, as semi-professional because it was less “scientific” but more literary than the “professional” American Journal of Philately. Kantner criticized smaller “amateur” papers that merely reprinted stories from larger journals and did not produce original articles. Quite aware of philatelists’ place within the greater American culture, Kantner commented that it was “not only a progressive age in general affairs but also in philatelic matters.”10 Philatelists used the structure of a club, like that of a professional association, to promote standards of practice. Many stamp collectors believed in American exceptionalism in all matters, including philatelic. One way to ensure that American philatelists contributed to a global print culture was to classify papers by their content and discourage just anyone from starting his or her own papers. As a group, stamp collectors were earning an expertise in their collections, but some philatelic writers, like Kantner, felt that even enthusiastic philatelists needed to respect the hierarchy and demur to the expertise of others. ¶ 13 Leave a comment on paragraph 13 0 Despite complaints by vocal writers such as Kantner, the journals lived on and connected thousands of collectors each year. Like professional journals, most philatelic publications kept members abreast of the field and facilitated communication among societies. 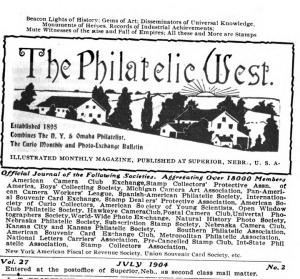 Articles featured news of first issues of American and international stamps, explanations of different types of stamps, philatelic literature reviews, and letters from readers.11 A handful of papers, like Weekly Philatelic Era, offered subscribers a free exchange notice to facilitate the commerce of stamps among the community that was enabled by the postal service. Beyond articles, most papers accepted advertisements from dealers in stamps and collecting ephemera. Such items advertised included albums and specialized tools for handling stamps. Merchants engaged with hierarchical rhetoric and might call out to “serious collectors” in an advertisement.12 Not only were collectors defining themselves in ways typical of the period, but in reading about their hobby they were also bombarded with advertising by dealers and manufacturers selling accessories including magnifying glasses, hinges, and tongs. A cottage industry grew up around philatelists. By reading these papers, collectors educated themselves in the minutiae of philately. ¶ 14 Leave a comment on paragraph 14 0 Connecting and corresponding with other collectors was an important part of the culture, and philatelic publications helped collectors connect with others to buy, sell, and exchange stamps. One did not need to belong to a club in order to acquire more stamps and participate actively in the hobby. Around the time that C.H. Mekeel began his Weekly Stamp News, he also printed a directory containing names and addresses of collectors and dealers who paid one dollar to be listed. Five thousand collectors responded in 1891, which increased to nine thousand by 1897, and each person’s entry described their collecting specialties, such as specific countries, and sometimes mentioned the languages in which they corresponded. The listings demonstrate global connections of collectors.Not only were collectors living outside of United States represented, but many American philatelists wanted to connect with foreign collectors and dealers. For example, Leon Lambert of St. Paul, Minnesota, desired to “correspond in English, French, Spanish, Portuguese, Italian, and Dutch to exchange on the basis of any catalogue. Sample copies of foreign papers desired.” Charles Townsend of Akron, Ohio, called out to collectors “in all part of the world, particularly those in Mexico, Central and South America, and the Islands in the West Indies.” And, dealers from Peru, Britain, Austria, Switzerland, Italy, and France bought ad space in this directory.13 Not only were stamp collectors and dealers supporting the governments who produced stamps by purchasing them, but were also supporting the postal system by conducting transactions through the mail. Stamp papers and directories provided contact information to allow collectors and dealers to conduct transactions and facilitate the practices of collecting on their own. ¶ 15 Leave a comment on paragraph 15 0 Collectors also used their philatelic papers to discuss what they liked about collecting. Some journals, like the Philatelic West, offered regular testimonials, and others published philatelic poetry that expressed the joys of stamp collecting or of reading a particular paper. In the Philatelic West, “Modern Maud Muller” skipped past her lover to get to the post office in a blizzard to retrieve the latest copy of her Philatelic West magazine, which she loved more dearly than her man, “And when to his heart her form he pressed, There was something nearer to her heart—THE WEST.14 This lighthearted poem penned by a man in 1901, jested that the Philatelic West was so good that a “modern” woman, would not be swayed by matters of the heart and put aside her love interests to read her favorite stamp paper. The poem also represented an enthusiastic female collector, an audience some publications tried to develop. ¶ 16 Leave a comment on paragraph 16 0 Readers of philatelic journals often heard from editors that they needed to recruit more members of their society or subscribers to the paper. Verna Weston Hanway encouraged philatelists to enlist at least one more collector and proposed starting philatelic societies in the public schools.15 One tactic was to recruit women as subscribers to stamp papers even if they were not members of a philatelic society. 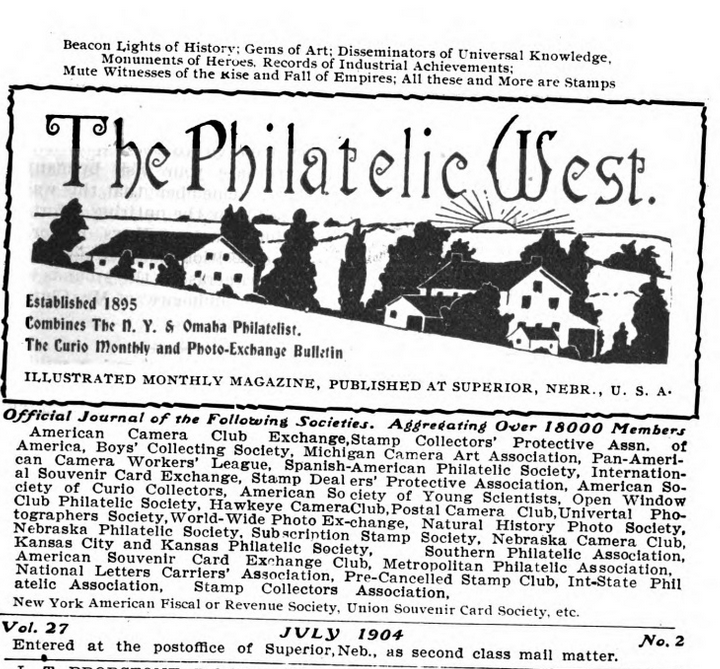 Some women read philatelic papers, like Philatelic West, whose editors recognized its readership. As early as 1905, the West offered readers a “Woman-Collectors’ Department” authored by Hanway. In her column, she encouraged women to collect and wrote various articles on stamps, curios, and books. She urged busy women to get a healthy pleasure to relieve them from the turmoil of their days that they might find pleasure in their collections. She tried to recruit women by writing in the pages of the West that women were genetically predisposed to be collectors because curiosity was “an essentially feminine attribute.”16Pennsylvania Philatelist and Philatelic West were the first papers that really identified a need to attract female readers and society members. Of course, since these papers were businesses, attracting any and all new readers or members was a key to their long-term success. ¶ 17 Leave a comment on paragraph 17 0 As philatelists discussed and defended their hobby, it is undeniable that stamp papers played an important role in the growth and shape of philately. Though some collectors and journalists did not like the proliferation of philatelic literature, one cartoon printed in A. C. Roessler’s Stamp News captured the reason for the paper’s existence. In panel one, the first man says to the other, “I don’t subscribe to stamp papers—they cost too much.” In the second panel, the other man holds the first one down, beating him, saying, “Without papers your hobby would be dead in a year, you poor it.”17 Granted, A. C. Roessler’s also needed to justify its existence and remind its readers to send in their subscription payments. But, the cartoon deftly illustrates that the print culture acted as the glue that connected stamp collectors from around the world and made stamp collecting a popular pursuit. Papers offered subscribers opportunities to acquire more stamps, to learn about different varieties, to best care for their collections, and to create an imagined community. Although many small American stamp papers disappeared or merged with other publications by the early 1900s, many still thrived and supported the growing numbers of stamp collectors into the twentieth century.